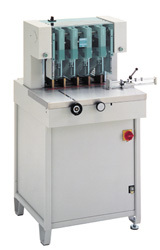 Nagel paper drills are manufactured to the highest of standards, they are rugged, professional paper drills designed for continuous usage. All models are ideal for print centres and binderies. Safe and easy to operate. Guarded in accordance with HSE guidelines. Suitable for conventional and computer stationery. The Nagel 490 is a high capacity, two, three, or four spindle Powerstroke drill with a smooth table-lift drilling operation and fast return for increased productivity, 60mm pile height, free standing, 3 phase.